Discussion in 'AMD x86 CPUs and chipsets' started by Yamunsa, Jan 29, 2013. With the wealth of reviews coming online over the last few months on AMD’s Trinity APU I thought it time to give the platform a onceover myself to see what the flagship FM2 chip has to offer. With the A10-5800K currently being AMD’s biggest offering it’s time to push the chip through the ringer and compare it to it’s main competitor. Having done the research at the cash register it seems unfair to pit the 5800K against a 3770k as AMD’s offering is under half the price so I chose to go the price-point route and will compare against Intel’s i3 3220. On the surface it may seem cheeky to compare a Quad core with a Duo with HT baring in mind that FM2 is currently not AMD’s 'big boy' socket the pricing route should be a good match. 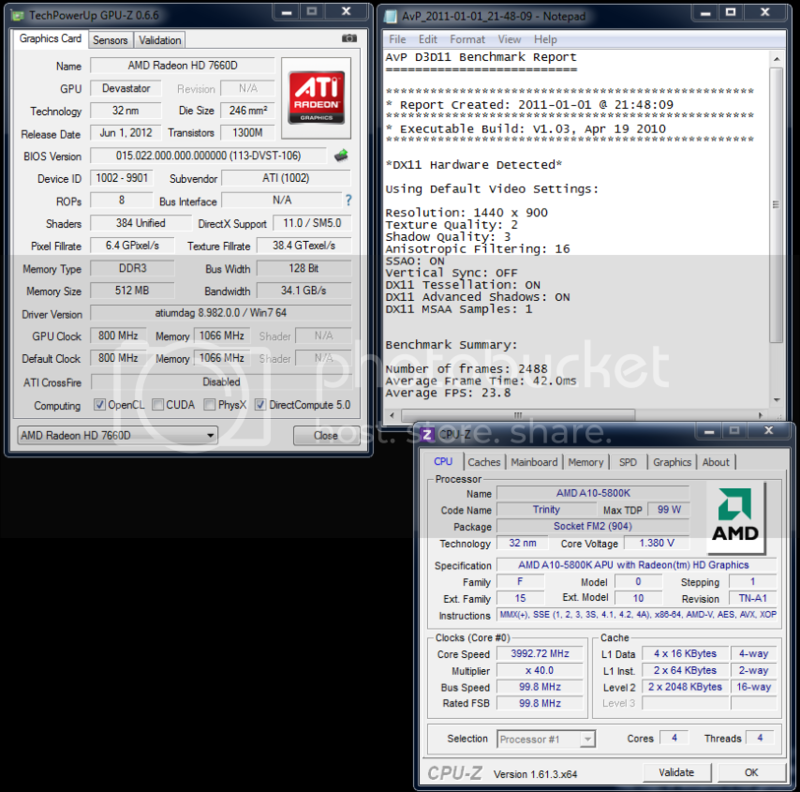 The A10-5800K is AMD's second-generation mainstream APU platform. Codename Trinity the APU sits in AMD's roadmap as the linchpin to it's main target markets - notebook & general purpose desktop, (to keep things tidy I'm not going into AMD's conformation of being at the heart of the new PS4 or for that matter that rumours have the A10-5800K is in the PS4 development kit. Speculation I know but I highly doubt it'll be a Trinity APU in the PS4 but having gone this far to mention it, with those sort of sales on the horizon you can certainly see the incentive for companies to explore alternative avenues). I could go on about the technical’s of AMD bringing on support for SSE4, AVX, AES-NI and all the rest but unless you’re an electrical engineer, regular enthusiasts like me want to know the simple things… how do the dam things perform? For the purpose of fairness between the two rivals I chose to stick with as similar a tech bench as I could muster. Same Rams, same PSU, same HDD and of course the same prepped OS, (Win. 7 Ultimate 64-Bit). 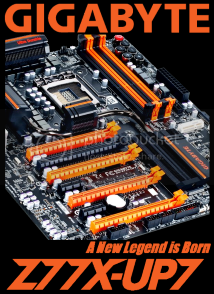 With the obvious motherboard issue in hand I’m lucky enough to pit Gigabyte’s best of both sockets against each other. 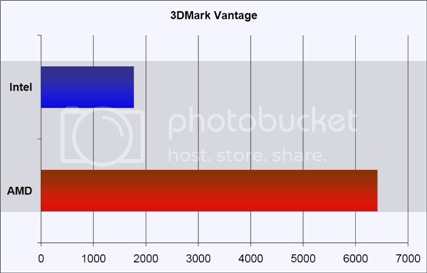 Using a mix of 2D & 3D benchmarks I hope to be able to demonstrate the difference in performance, if there is one between the two chips as well as discuss the benefits and potential applications each platform may have. All benchmarks will be run on respective platforms at full stock settings, on their stock heatsink assemblies, as well as using XMP for the rams. 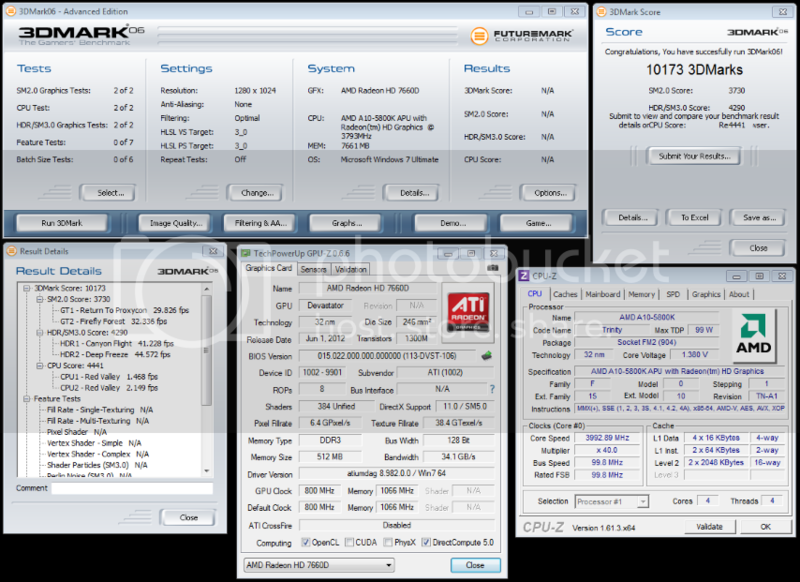 It is also worth noting that the A10-5800K, when planted in the UP4 defaulted to a 40 multi / 4GHz core clock speed. With it boxed as 3.8GHz and having a turbo boost to 4.2GHz I chose to leave the 4GHz alone and press on.. For a good proportion of buyers looking at this platform I surmise that this is what would likely happen in the real world. 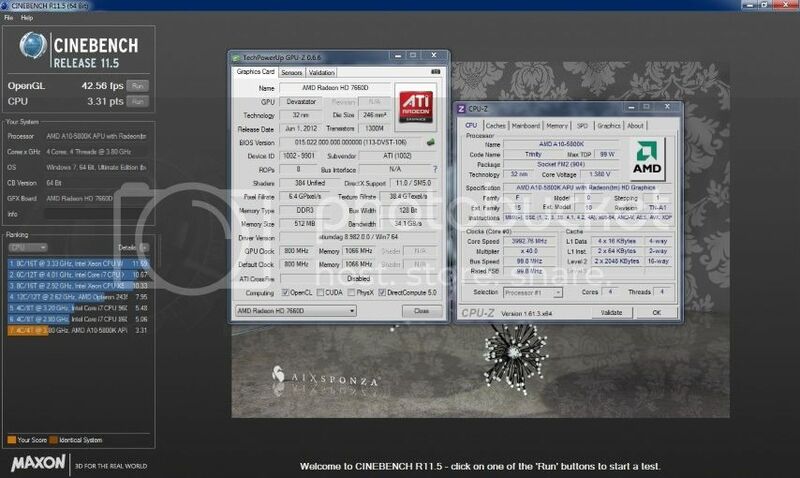 At a later date I will analyse the A10s overclocking abilities and will address the increased clock speeds and performance. I've also chosen to monitor power consumption, being pulled from the wall, throughout the testing window and will show the final result. Behind each graph I've also linked the lead screen shot for reference. 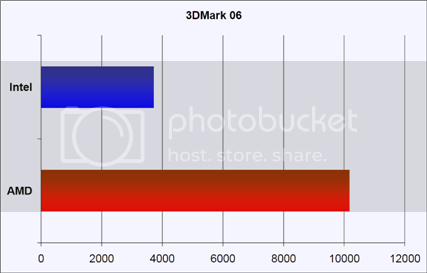 With the first benchmark completed it is obvious to see that the A10s discreet GPU, the 7660D, is likely to be a far superior offering. This result is pretty interesting to me for all the wrong reasons. 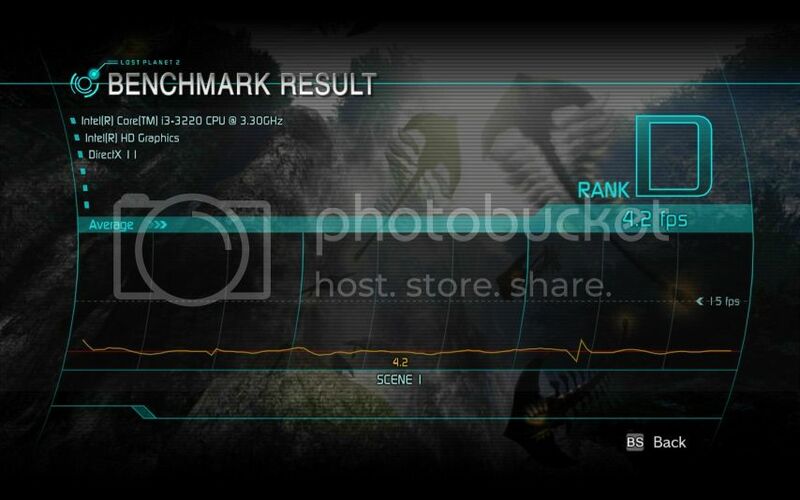 Yet again the onboard graphics from AMD's unit significantly pulls ahead but if you look closely at the scores you'll notice that physics is very similar. 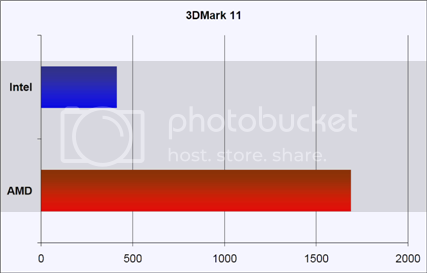 With 3DMark 11 being based on the Bullet physics engine I had assumed before running the benchmark that AMD would have been able to pull ahead, if only on a driver level, due to their ability and historical proficiency in being able to manipulate Tessellation. The fact that Intel are level-heading here strikes me that either they have pulled the rabbit from the hat or AMD's left hand is not talking to the right? 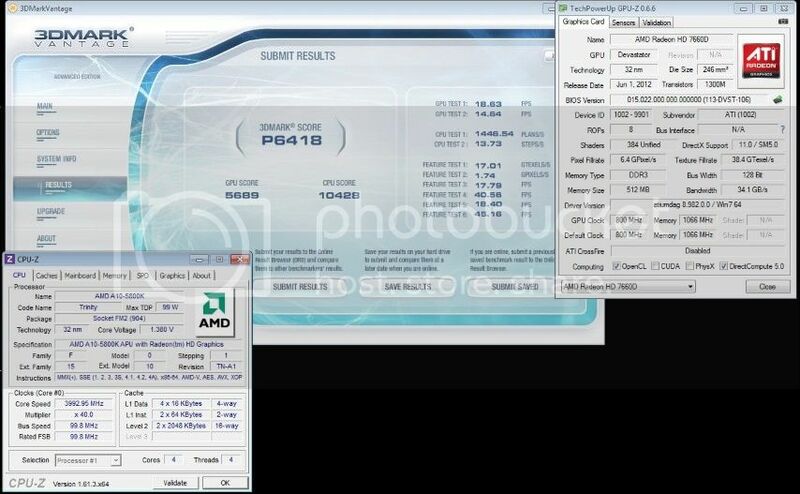 The AMD unit smashes it's way through this benchmark with four times the average FPS. A strong result indeed. 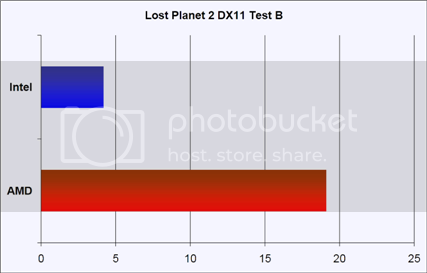 Interestingly both CPUs come in with the same score. I will cover this a little more in my conclusion. 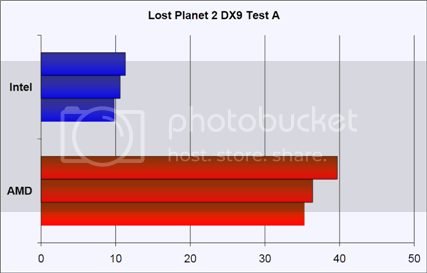 As we see above the A10 performs admirably even when compared to entry level graphics cards like Nvidia's 630. I have to admit that for an onboard unit I am impressed. Ouch! This is where things start to change. 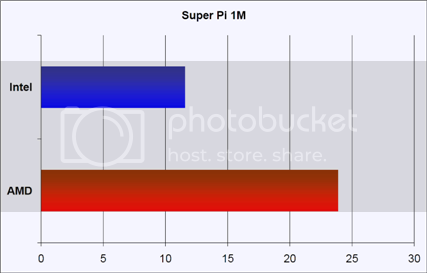 With Super Pi being a single threaded it's a good benchmark to highlight CPU's core speed. As we can see Intel has the edge, the blade, the hilt and is encroaching on the handle. 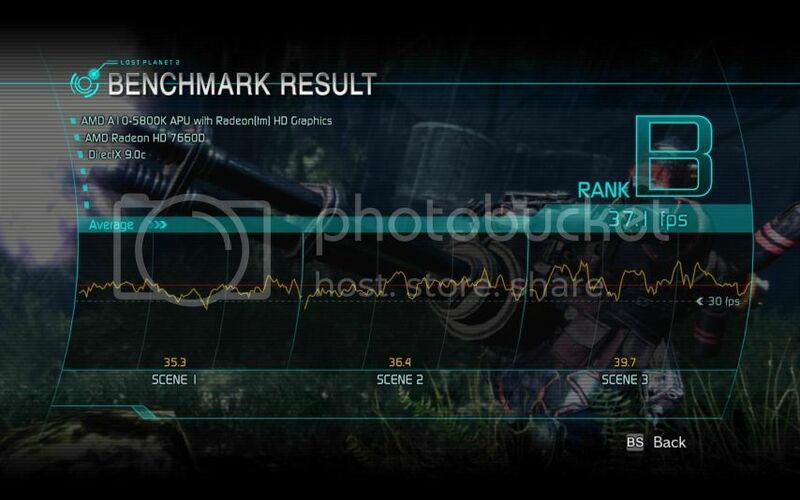 Another solid return on FPS from AMD. Not only is the Max and Average frame rate consistently solid but unlike some Ati graphic cards the minimum frame rate is well under control. 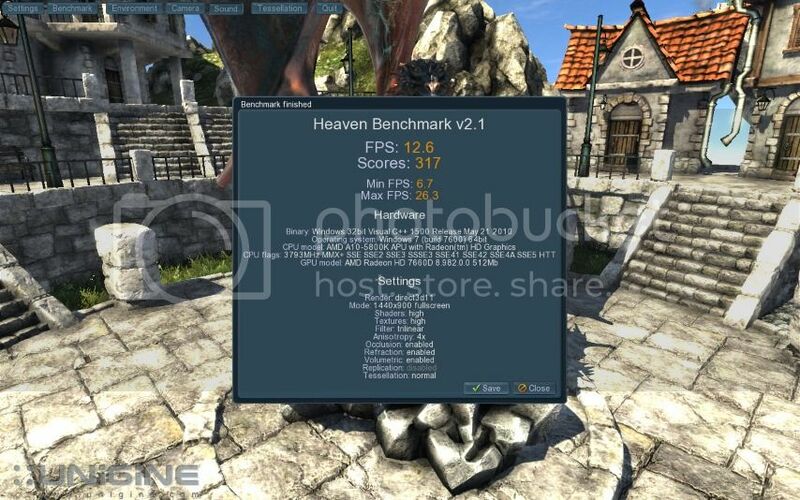 Knowing that Unigine Heaven uses Tessellation to the point that it has brought low-end Ati graphics cards to it's knees I had assumed before running the benchmark that the 5800K would have been given a hard time here. Interestingly this was not the case. 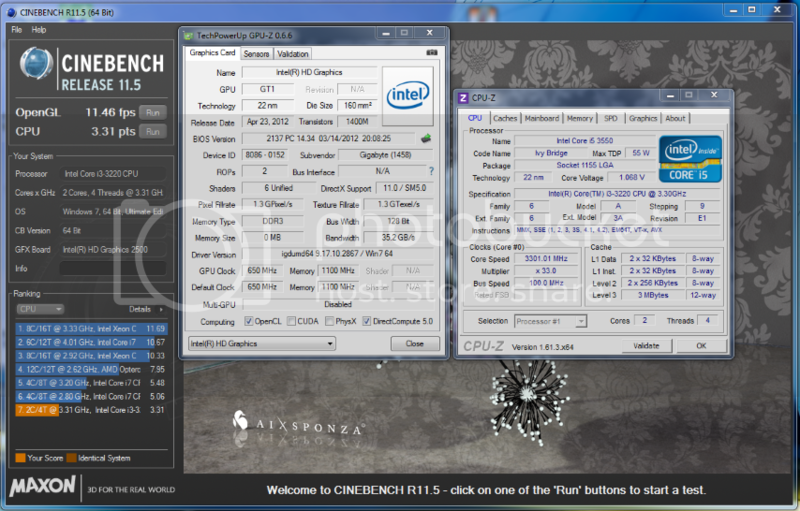 The 5800K scoring over double the overall FPS of the 3220 and having a very acceptable minimum frame rate. 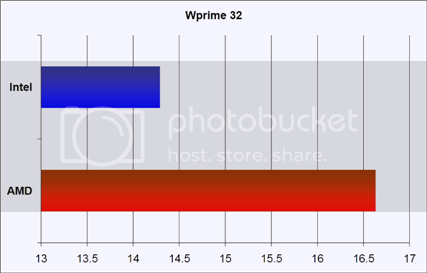 This result strikes me as at odds with the 3DMark 11 result but it's great to see AMD's ability to build on previous architecture. Now this result really surprised me. 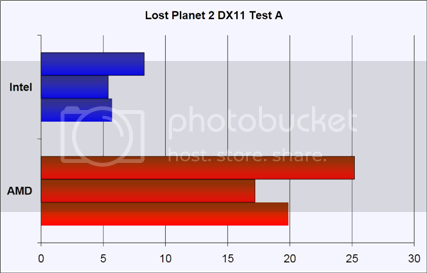 Expecting to see AMD pull ahead on the CPU result, being a Quad core unit over Intel's Duo it was disappointing to see the Duo move ahead in a multithreaded benchmark. 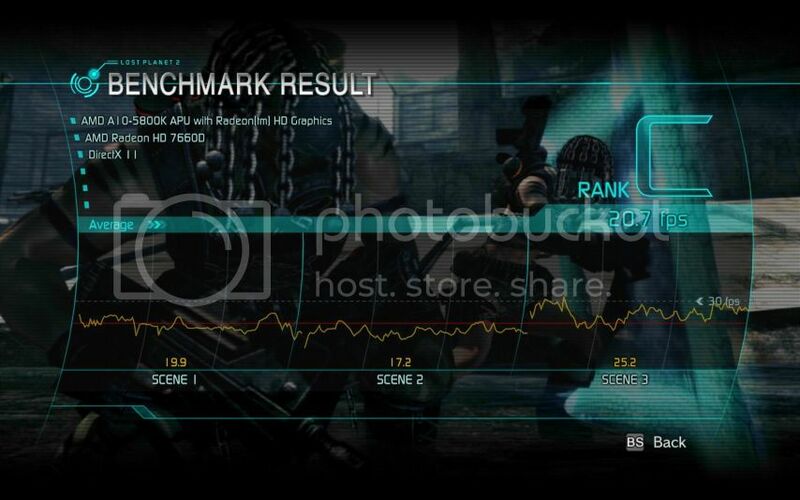 Saying that we can see the 5800Ks discreet GPU absolutely crushed the graphics side of the benchmark and ultimately the overall score. 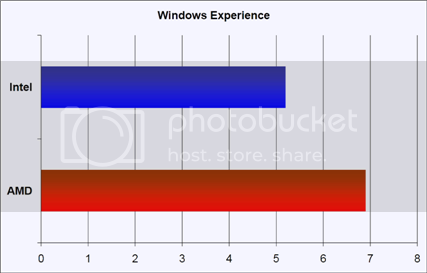 Unsurprisingly AMD comes out on top but it was interesting to note that the Windows Experience Memory test didn't prefer the tighter timings over the extra MHz on the rams but it did like the two extra true cores the 5800K has over Intel's Duo with HT. These results really reflect where my gut feeling when looking at this review. 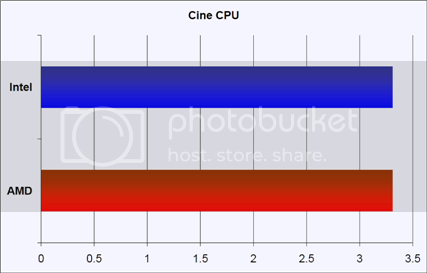 Clock for clock the i3 3220 is the stronger unit but its dominance is not linier in multi-threaded applications. Sitting at the bench building this review, my final thoughts are a little troubled. The FM2 / A10 platform responded well, felt snappy to operate and has kickass onboard graphics. Price wise it's a very competitive unit. To get the Intel rival to meet the same gaming potential a buyer is looking at spending another $100 on a GFX card to bring it up to muster. 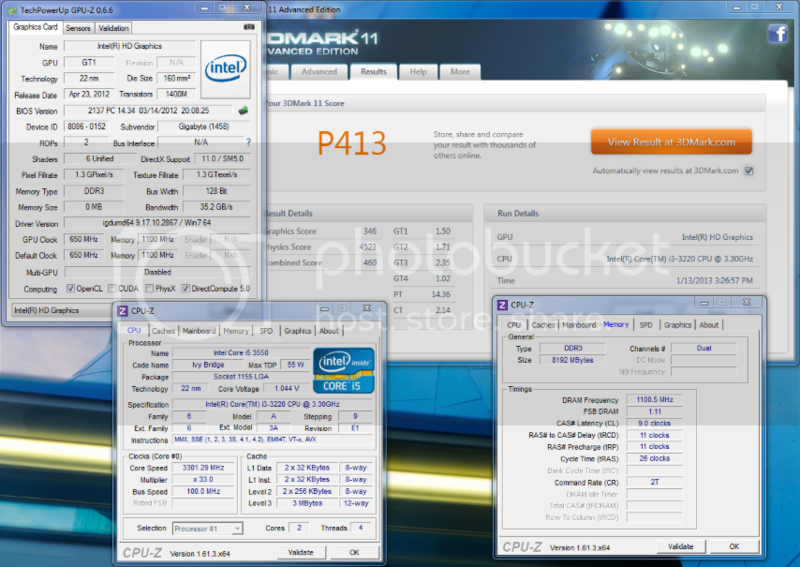 Thing is.. for AMD's leading current Gen Quad the 5800K just doesn't have the raw clock speed I personally want to see. AMD just seems to have abandoned the competition for brute strength with Intel leaving consumers with a one horse race if that's what they are looking for. 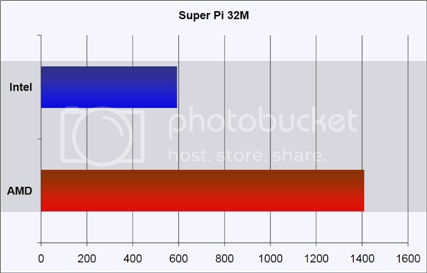 Furthermore it is worth noting that to date the FM2 platform has not adopted Pcie3. There is a very valid argument that the Gen 2 bus is still not being exhausted in current use but for most it is a feature expected and it's inclusion goes somewhat towards the argument of future proofing. That said this APU has be aligned with the budget conscious. Not that it won't be done but I doubt many FM2 rigs will be put together with Crossfire 7970s or $1000 Gen 3 raid cards but for consumers it would be nice to have the choice. Having built too many systems to consider remembering there is most certainly a place for Trinity in the desktop market. If you are looking for a home server or 24/7 encoder this is not the platform for you, (although from personal experience it's faster on Handbrake than the i3). When I'm next asked to put together a general purpose desktop for small business, a HTPC or arguably a budget LAN gamer I wouldn't be looking further than the A10-5800K. 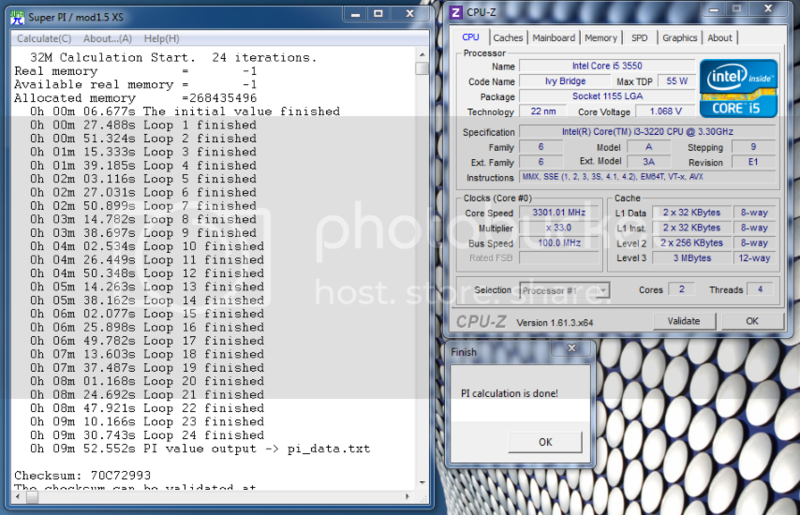 As for the i3 3220, it is disappointing that Intel have not released an unlocked multi Duo since 1156. 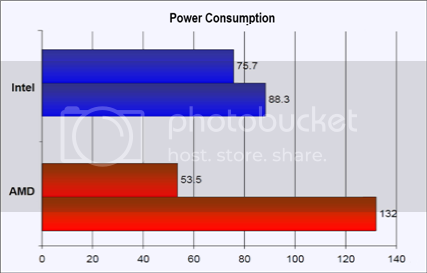 No doubt Ivy bridge packs a punch with is raw processing power and the iGPU onboard the 3220 comes with is more than enough to watch Blu-ray, online or terrestrial TV. If your a bit of a retro gamer is owns Command & Conquer but.. if you wanted to play something a little more modern at 1080p you'll be wanting to add 3rd party GFX. The upside to both platforms is the price and performance delivered for what would ultimately cost you less than half a single top-end GFX card on today's market is excellent. If I had $300 in my pocket I know which machine I would be putting together. Thumbs up AMD. I love the trinity chips. Overclock well and with the trend in small form factor build these are great. Some high speed ram and an overclock and away ya go to budget lan gaming madness. loving these trinty chips. 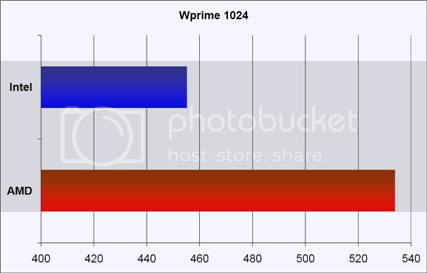 but i think the gpu core still needs some work, something like a 7770 in a cpu would be amaze sauce. another thing to note in the review is the price. And the amd board has in my opinion more features including eyefinity more sata 3 ports etc. but having said all that i have built both systms(with a hell of a lot cheaper intel board and side by side i would drive the AMD any day. 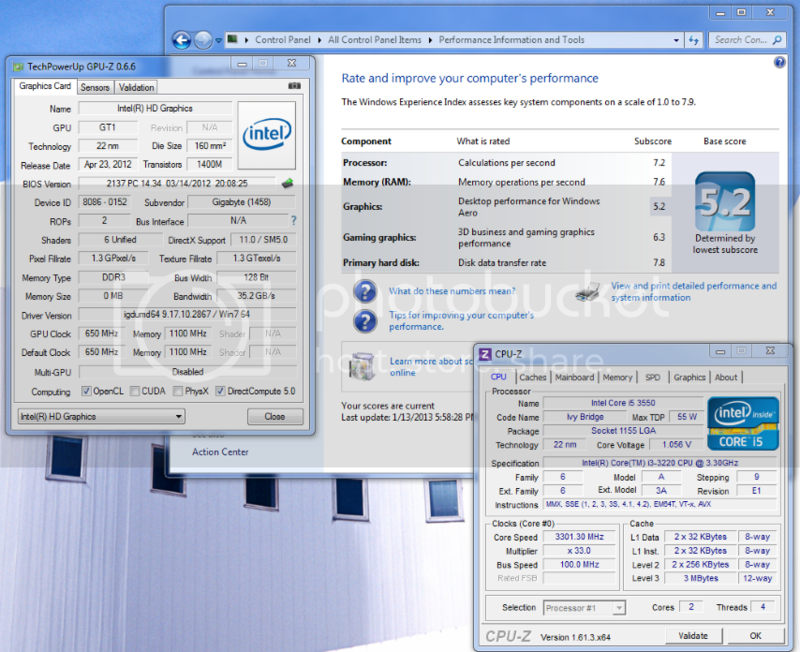 The intel felt flat and slow in pretty much everything on a day to day desltop use type setup. 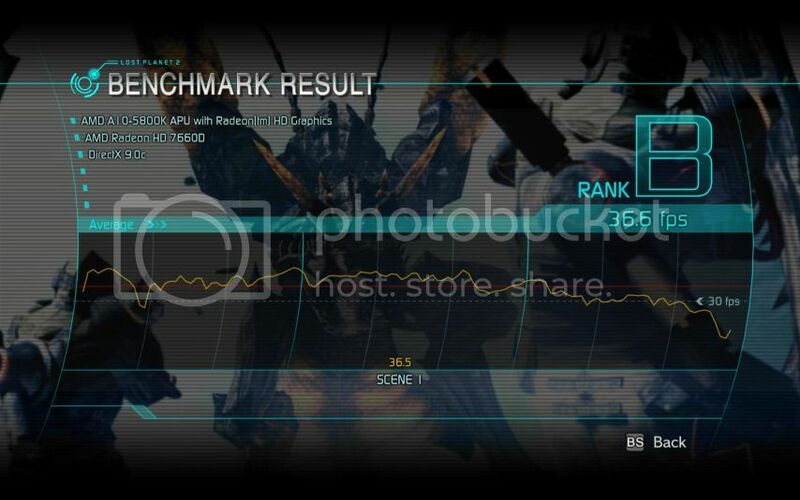 But thats just observation no benchmarks to back it up. That said the only effected score would have been Power Consumption and that would have hurt the Intel result which still came out in front. 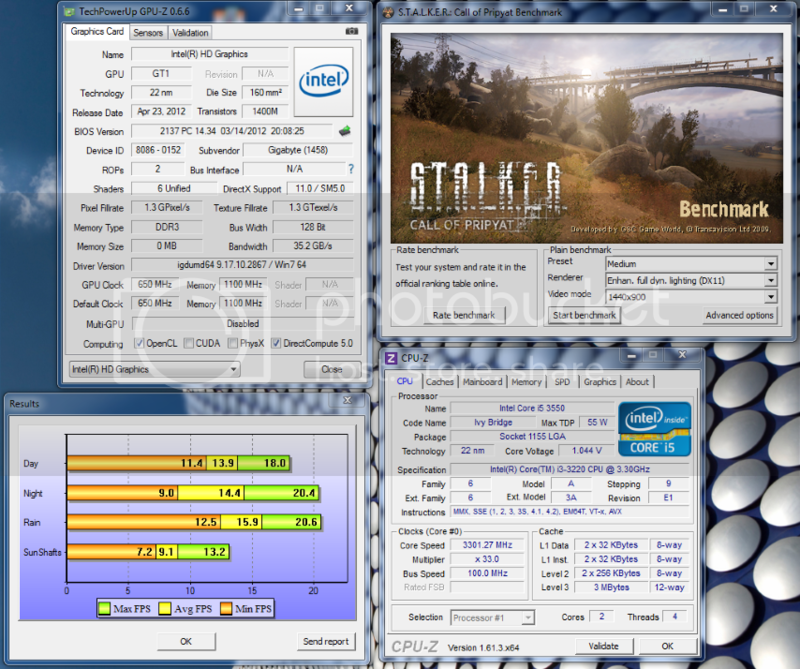 From the tests undertaken theres no doubt in my mind that the A10-5800K is well ahead of the i3 3220 for everyday use, (even when the tests were carried out on mixed priced motherboards). 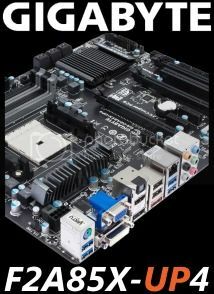 Considering an FM2 build for my first ever Hackintosh. Not so sure on the compatibility though lol. they put up guides and reviews on newer stuff. ive seen lots of GBT gear used, seems to generally be one of the more compatible board brands from what i can see there not that anyone at GBT really tries to make it happen. all the boards are GBT there but Intel based. You'd have to jump on the forum to see what the deal is with AMD based chipsets. I've been over at X86 but the tonymac site looks like it has more community help. I have never used any of the AMD APU's. Been ithchin to try one for a while. Even if the Hackintosh project did not work, it would still be a capable Windows gamer with a 7850 or similar. 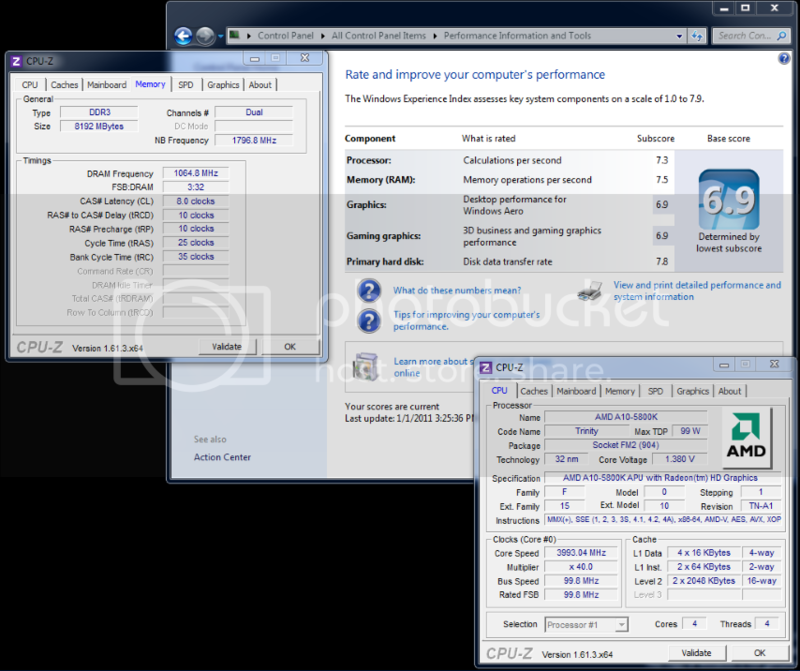 I've found in the past that RAM overclocking gives a massive boost in APU's performance. Really cool! Won't work for Hackintosh as in snow leopard there is no support for the GPU so you will not get acceleration but may get resolution selecting. 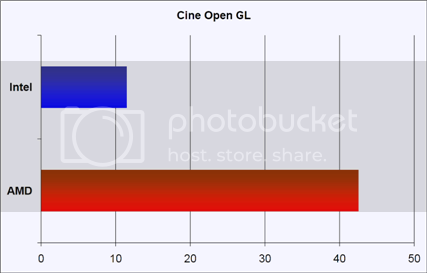 Lion and Mountain Lion are a definite no go as the current AMD Kernels can be considered as pre alphas at best, also no GPU support in both oses. If you want to hackintosh go an intel build with a compatible Nvidia GPU and you will be hard pressed to tell the difference between it and the real thing. do a test with a game you can run in software acceleratyed mode like...quake? doom? even ye old UT 1 then check poer and then run it with dx at the same resolution and see what the difference in power is. Hmm isn't that what the turbo is for? Meaning it will scale up the CPU to 100W power if the GPU isn't stressed?